Asset ADN14203E front brake pads ( 4 ). Nissan Sunny 1.2 Saloon Coupe Estate 120Y B210 1/73 - 12/75. Nissan Sunny 1.2 Saloon Coupe Estate 1200 B110 1/71 - 12/73. 2 have an L embossed on the back plate. 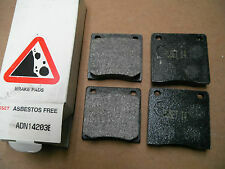 Nissan Sunny Pulsar Gti-R Front Brake Pads,new In Box,quality Parts With Shims. New front brake pads for N14 Gti and Turbo,quality parts new in box. 100NX, 1.6i 1991-95. 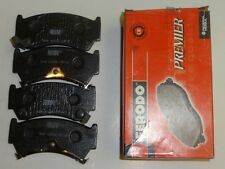 SET OF FRONT FERODO BRAKE PADS FOR. SUNNY, 1.6i, 2.0D 1991-95. Nissan Sunny Pulsar GTI-R,front brake pads,New genuine parts.41060-0N685. New genuine Nissan front brake pads,N14 Turbo models. BRAKE PADS fits NISSAN SUNNY Box - 90>00 - FE16275. Nissan Datsun Pulsar Sunny (1962-1983). NISSANDATSUN 120 Y Coupe (KB 210) 1962 - 1980. NISSANPULSAR Estate (VN10) 1978 - 1983. NISSANPULSAR Hatchback (N10) 1978 - 1983. New Front Brake Pad Set. NISSANDATSUN 120 Saloon 1962 - 1980.